One of Bustle's "17 Best Nonfiction Books Coming Out In June 2018" • One of The Revelator's "16 New Environmental Books for June" • One of Equinox's "5 Books High Performers Should Read in June" • One of Foodtank's "18 Books Making a Splash This Summer" • One of CivilEats' "22 Noteworthy Food and Farming Books for Summer Reading—and Beyond"
From the voice of a new generation of food activists, a passionate and deeply-researched call for a new food movement. If you think buying organic from Whole Foods is protecting you, you're wrong. Our food—even what we're told is good for us—has changed for the worse in the past 100 years, its nutritional content deteriorating due to industrial farming and its composition altered due to the addition of thousands of chemicals from pesticides to packaging. We simply no longer know what we’re eating. An independent journalist and nutrition expert, Lawless is emerging as the voice of a new generation of food thinkers. After years of "eat this, not that" advice from doctors, journalists, and food faddists, she offers something completely different. Lawless presents a comprehensive explanation of the problem—going beyond nutrition to issues of food choice, class, race, and gender—and provides a sound and simple philosophy of eating, which she calls the "Whole Egg Theory." Destined to set the debate over food politics for the next decade, Formerly Known as Food speaks to a new generation looking for a different conversation about the food on our plates. 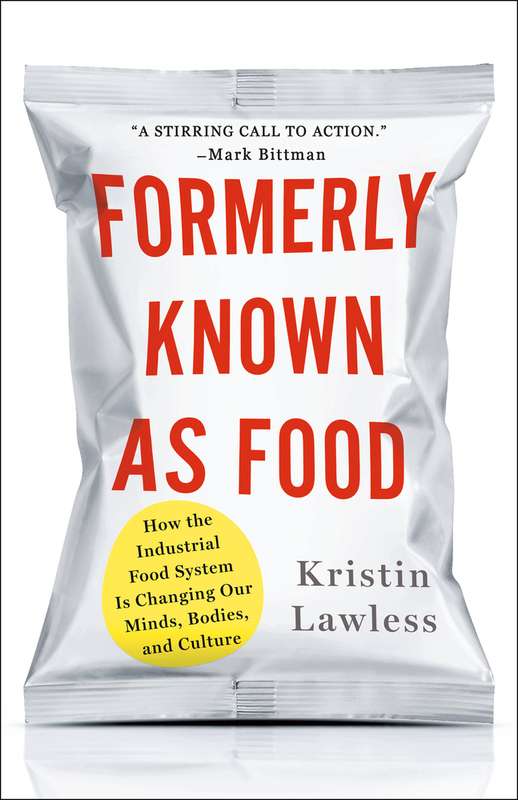 Naomi Klein, author of No Is Not Enough and This Changes Everything: "In this revelatory survey of the dangers of the industrial food system, Lawless offers crucial tools for navigating it safely. The best ones have nothing to do with shopping advice: she asks us to think holistically about food, why it can't be separated from other struggles for justice, and what it means to demand transformative change." Mark Bittman, author of How to Cook Everything: "A stirring call to action. Lawless has done a thorough job of describing how so much of what we eat doesn't qualify as 'food'"
Mary Esther Malloy, MA, Mindful Birth NY: "Groundbreaking... will get you thinking differently about how you nourish yourself and your family." KRISTIN LAWLESS (previously published as Kristin Wartman) is the author of Formerly Known As Food and an independent journalist focusing on the intersections of food, health, politics, and culture. Her work has appeared in The New York Times, The Atlantic, Newsweek, VICE, Huffington Post, and Civil Eats, as well as in academic journals, such as The Black Scholar, Critical Quarterly, and The New Labor Forum. Kristin is a Certified Nutrition Educator and works as a nutrition consultant with doctors in New York City. She lives in Brooklyn with her husband and son.